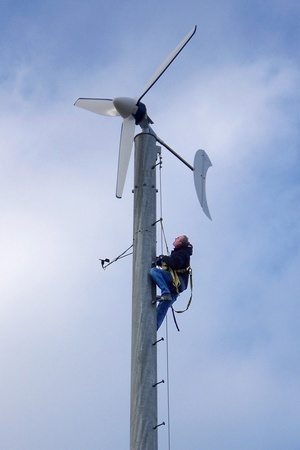 Posted on Tue, Nov 23, 2010 : 9:15 a.m.
John Wakeman of UUAA and SUR Energy LLC climbs the monopole during installation of a wind turbine at First Universal Unitarian Congregation on Nov. 19. On Friday afternoon, the First Unitarian Universalist Congregation of Ann Arbor (UUAA) raised what some have called a "steeple of the future" — a 2.5 kilowatt wind turbine atop a 90 foot monopole at 4001 Ann Arbor-Saline Road, south of Ann Arbor. Combined with the 10.8 kilowatt bank of solar panels installed a week earlier, the wind turbine installation culminates a multi-year effort of the congregation's Renewable Energy Team, led by UUAA member Dave Friedrichs. According to UUAA Executive Director Thom Bale, the $100,000 project "represents the congregation's desire to turn its values of stewardship and environmental responsibility into practical actions to benefit the church and larger world." The congregation began investigating the potential for wind power back in 2002, Bales said. In 2007, UUAA launched an effort called "Celebrating our Planet," exploring global and local initiatives to use environmental resources wisely. With new information about improved wind turbines, the Wind Project Committee was renewed. Over the next couple of years, the committee solidified plans and raised about $100,000 for the renamed Renewable Energy Project. The final projected included 48 solar panels on the south-facing roof (totaling 10.8 kilowatts), a 2.5 kilowatt wind turbine and a "Renewable Energy Plaza." The solar component enabled the congregation to take advantage of DTE's Solar Currents incentive program, generating more than $20,000 toward the church's renewable energy efforts, explained Friedrichs. Bales noted that the passion and expertise of the Renewal Energy Committee, including contractors John Wakeman of Sur Energy and Dave Friedrichs of Homeland Builders, who invested their own "sweat equity" in the installation, helped spark the congregation's enthusiasm. The church plans to monitor the energy output and broadcast it on their website, as well as provide ongoing education about renewal energy. "It's such an important, central part of the Unitarian Universalist spiritual values," noted Bales. See photos of the solar panels and the wind turbine installation below. Photos by Angela Cesere of AnnArbor.com and John Frank of UUAA. Pam Stout coordinates Faith and Home & Garden coverage at AnnArbor.com. She can be reached at pamstout@annarbor.com. Tue, Nov 23, 2010 : 9:56 p.m.
Tue, Nov 23, 2010 : 2:50 p.m.
Neat... How loud is the turbine?